I flew to Milwaukee and arrived in a rainy drizzle. However, the welcome of the Wisconsin Daughters and Judy Mason, State Regent was warm and sunny. I was impressed by the many accomplishments noted in their reports. Teamwork makes a difference. Judy’s theme is “Together Everyone Achieves Mission”. From what I could tell they are making her theme a reality. Their togetherness was evident and they even found a way to make photographs fun. Great job, Wisconsin Daughters. 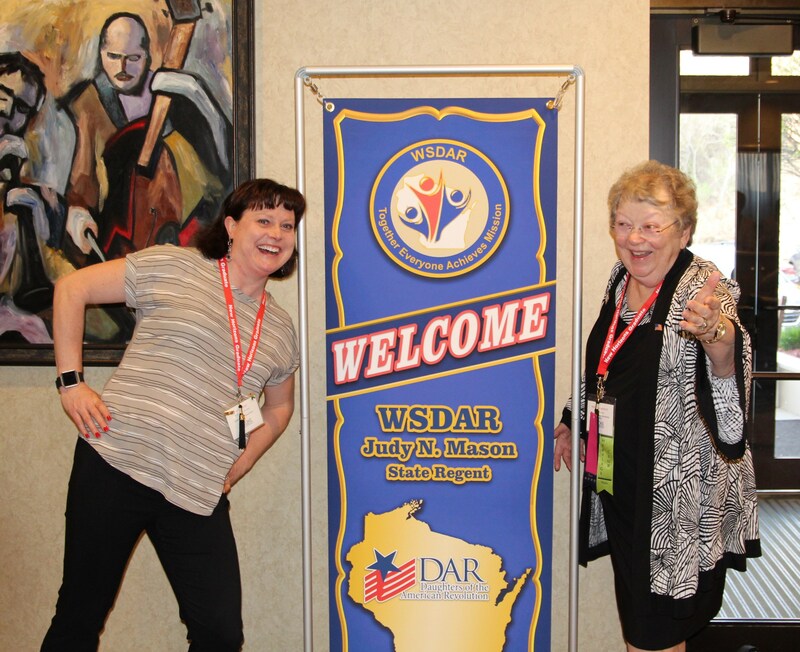 The 122nd Wisconsin Society Daughters of the American Revolution Conference was convened May 4-5, 2018 in Milwaukee, Wisconsin with the highest registration of members (162) in three decades. The theme of the Mason Administration is TEAM – Together Everyone Achieves Mission – Wisconsin Daughters United in Service. Eighty -seven Daughters were honored to welcome Mrs. Ann T. Dillon, President General at a President General’s Breakfast hosted by Nancy Lesh, State President General’s Project Chair. This State Conference was designated to celebrate 2017 service to Historic Preservation. A poster highlighted Wisconsin’s Historic Preservation service by all chapters in the state. A challenge was then issued to record the last thirty years of Wisconsin Society history, to be published before 2019 the Conference. In honoring the theme, I was pleased to surprise Wisconsin Daughters by gifting WSDAR a gavel. The gavel is crafted from a Cambridge, MA elm tree, near where George Washington took command of the Continental Army in 1775. This gavel was used by Frances Trottman, State Regent 1928-1931, 90 years earlier. Georgia Smith, State Historian and Project Patriot Chair reported that the chapter assembled twenty-one holiday boxes were received by active duty nurses in Cuba. Thirty one of the thirty four chapter regents presented interesting and inspiring 2017 chapter service reports. Brenda Majewski’s New Horizon Capstone project coordinated Daughters to bring paper products and non-perishable food for Homeless Veterans residing in tiny homes in Racine. Nancy Burns leads the Operation Mail Call service project to send signed birthday and holiday cards to all veterans living in VA facilities in Wisconsin. The Membership Recognition luncheon honored chapters and Daughters for outstanding service: Our Fifty Year Members, four Chapter Membership Trekker Awards, eleven New Horizon Graduates, fifteen New Member Graduates, seven Chapter Regents completing terms, six chapter Outstanding Juniors, Lara Grant received Thatcher Award, Caitlynn Nemec received the literacy award for her book A to Z, Birds of Wisconsin, Barbara Nemec was named VIS State Award winner, Nancy Underbakke was paid tribute for entering over 20,000 names for Project Patriot Records; Betsy Grant received the DAR Service to Veterans Award. Wisconsin American History Teacher of the Year, Linda Garcia rocked the ‘house’ with her Educational Luncheon presentation. 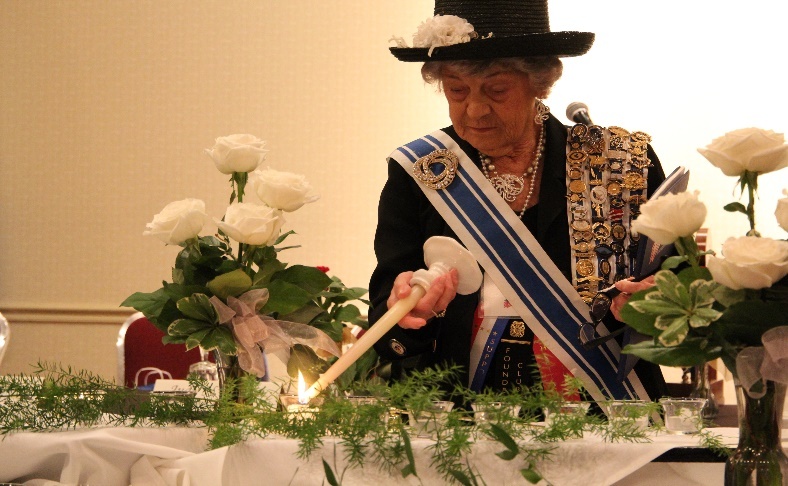 Barbara Kiser, WSDAR Chaplain planned a Memorial service to honor thirty-six Sister-Daughters with a candle that was lit and then snuffed, however the light of their service remains bright. Tribute was given to fifty-sixty year members Helen May Gilboy, June Morris Ardovino and Joan Wendel Ketchum and two Honorary State Regents: Barbara Small Wood Janikowsky and Marilynn Ruth Baxter. Our Gala Banquet was an elegant evening of delicious food and camaraderie, highlighted by our President General sharing her inspiring and motivating message of putting aside grievances and uniting to fulfill DAR mission. To highlight the theme Daughters and guests, including Wendy Stanley Jones and Karen Stroever, sang The Star of Wisconsin written by State Regent Frances Feathers, copyrighted in 1909 with proceeds purchasing the Wisconsin Box chairs. #TBT 125 years ago, on April 19, 1894, the Sequoia Chapter in San Francisco, California, planted a �... 19 hours 58 min ago.